This essay is the original draft of Chapter 3 ("Research on Natural Syntactic Development") of KISS Grammar (You'll Love It), a TRIP book written under contract for NCTE. For the final version of the TRIP book, we decided to summarize the research, thereby omitting many of the supporting details (and complications). The chapter is reproduced here for people who may be interested in such details (and who have a good supply of aspirin). The statement that such research is "pedagogically irrelevant" requires amplification. As Crystal quite correctly goes on to note: "it is possible to extract a general conclusion from this and similar experiments, namely, that there are matters of structural (and in this case also semantic) interpretation which it takes children many years to acquire." But once we accept the idea that syntactic development occurs over a period of years, perhaps even throughout an individual’s whole life, no further pedagogical conclusions can be drawn from such research: it suggests nothing about what we could or should teach. At age five, most children have trouble with this particular distinction; at age eight, most of them have mastered it. But they have figured it out for themselves -- no "instruction" was involved, no "pedagogy." The number of complex structures which children somehow figure out for themselves is awesome. I remember, for example, listening to my four-year-old son, speaking about a light, and saying, "Turn on it," instead of "Turn it on." Why children go through this stage, and how they work themselves through it, again pose complicated linguistic and developmental questions. But these questions are not "pedagogical": children work their way out of them, all on their own, without any other instruction than access to conversations, just as they work their way through and out of "I readed a book" and "I cutted up the paper." There are many things we can’t teach, and shouldn’t try to. This does not mean that the developmental research of the last two decades is totally valueless: it has provided and confirmed some important general principles of language development, and, in such fields as teaching the learning disabled, it even provides many practical suggestions. But for the normal child, studies which involve linguistic development in pre-school children are irrelevant. For relevant studies, we must return to the sixties and seventies and the work of such people as Kellogg Hunt, Roy O’Donnell and Walter Loban. The figure for "Adults" is from Hunt’s study of essays published in The Atlantic and Harper’s. Although there are numerous questions surrounding such statistical studies, the basic conclusion remains valid: if samples of writing are taken from students (of similar socio-economic status) at different grade levels, the average number of words per main clause will show an increase similar to that above. Likewise, a study of passages from a variety of published writers will often result in a count of approximately twenty words per main clause. Hunt's research is very important. (KISS Grammar would not exist without it.) There are, however, two fundamental (and probably interrelated) problems in it. Hunt was looking for a way to measure "maturity." He tried the "T-Unit," and it gave him the type of graphs that he was looking for. But Hunt rarely addresses the causes of such increased maturity. As we will see, he gave important bits and pieces of a comprehensive theory of natural syntactic development, but, perhaps because he was missing an important piece, he never put the whole picture together. It may have been this lack of a theory that caused the other problem. Hunt, O'Donnell, and Loban all concluded that subordinate clauses "blossom" (to use Hunt's term) between seventh and eighth grades. The following table is based on O'Hare's summary (p. 22) of Hunt's and O'Donnell's studies. We need to be cautious with these results. The numbers for fourth, eighth, twelfth, and "Superior Adults" come from Hunt's study; the others, from O'Donnell's. Differences in the way constructions were defined and counted may make the results not totally comparable. The table, however, does suggest a major "blossoming" of subordinate clauses between seventh and eighth grades. We also need to remember that neither Hunt nor O'Donnell was doing comparative ("horse-race") studies. They simply collected and analyzed samples of students' writing at different grade levels, and they rarely, if ever, discussed the instruction (in grammar or writing) that the students had received. I have quoted this at length because it further supports the "that" knowledge developed by these researchers, and it also suggests their reticence to discuss "why." O'Donnell himself simply presents it as "enigmatic," and Harrell apparently suggested that adjective clauses are more difficult to manipulate without exploring why. All of the researchers attempted to break "subordinate clauses" into smaller categories (noun clauses, adjective, adverbial, etc. ), but years of attempting this type of research have convinced me that such distinctions become very tenuous unless the transcripts of the original data are available for review. At the end of this chapter, I will suggest that more research in this area is needed (and why we don't currently have it), but for now I would suggest that we have to believe that a natural blossoming of subordinate clauses occurs in seventh and eighth grades. O'Donnell and the Concept of "Formulas"
I suggested above that the researchers whose work we are considering were focused on the "what" of natural syntactic development. Probably with good reason, they were very hesitant to explore the "why." One can't very well explain why things happen within a dynamic system until one has at least a fairly good picture of what its components are. The "why" question must have perplexed these researchers, but in a subject area as new and complex as this, they had to focus on one thing at a time. In publishing their work, moreover, their primary objective was to get their main ideas accepted. Anyone who has done this type of research realizes its complexity, and it would be very easy for a researcher to overwhelm the positive findings of a study with complications. Downplaying the "why" was one way of avoiding these problems. In his section on "Conclusions and Implications," O'Donnell parenthetically alludes to one such problem. In the first paragraph of the following, O'Donnell comes as close as he ever does to suggesting a sequence of natural development beyond subordinate clauses. In the second, he mentions "formulas." On the other hand, there was a group of items that appeared more than sporadically in kindergarten speech but were used from about three to ten times oftener by seventh graders. At various levels, there were significant increments in their use. These would appear good candidates for identification as generally later acquisitions. They were noun modification by a participle or participial phrase, the gerund phrase, the adverbial infinitive, the sentence adverbial, the coordinated predicate, and the transformation-produced nominal functioning as object of a preposition. The first paragraph supports the basic "that" conclusions mentioned previously, and it extends them into areas that will not be covered in this book. Coordinated predication (She read a book and then took a nap), for example, would be an interesting area for research. Some researchers have counted this as two separate main clauses, and others have reported conflicting results about when and how often they appear. It should be obvious, however, that such coordination may have a significant affect on main-clause length. The most interesting point in the quotation, however, is the parenthetical allusion to "formulas." Although I may have missed something, I have tried several times to find other references to this concept within O'Donnell's study, but with no success. This may be because the concept calls into question much of the statistical research of all three researchers. It is generally agreed (and a matter of common sense) that much of language is learned not as individual words, but rather as strings of words. This is obvious, for example, in idioms such as "It's raining cats and dogs." It is also apparent in many verbal phrases ("Wake up." "We get along.") Formulas are thus an aspect of vocabulary, but they are also an aspect of syntax. Syntactically, for example, some tenses are probably learned as formulas. Children repeatedly hear, for example, such things as "You are going to the store." "They are talking on the phone." "We are playing a game." What they learn from this is a syntactic string -- "___ are ___ -ing" into which various pronouns (and, of course, nouns) and verbs can be inserted. We can also see it, for example, in young children's use of some "subordinate" clauses. These children hear "when ___ get(s) ___" dozens of times, and probably pick this up as a string, i.e., a formula. If I understand O'Donnell correctly, he is implying that such formulaic expressions do not represent cognitive mastery of the underlying syntactic construction. The concept is very important and deserves much more research because it complicates research on natural syntactic development. Highly influenced by transformational grammar, O'Donnell believed that he was counting sentence "transformations" that result in more mature writing. One of the things he counted was coordinate constructions within T-units. (69) As a simple example of this, we can look at a simple compounding which probably does reflect syntactic growth. A very young child might say, "Mommy went to the story, and daddy went to the store." An older child is more likely to say, "Mom and dad went to the store." The transformational rules involved are complex and may differ depending on which transformational grammar one wants to use. We can easily see, however, that the more mature version involves deleting the repetitious "went to the store," and embedding the second subject into the first main clause. Thus, some compounds are clearly reflections of growth. But would anyone want to suggest that the compounding in It's raining cats and dogs is? Even in adults' writing, formulas are probably very frequent. They are certainly relevant to any analysis of the writing of college students. In a short essay discussed at the end of Chapter Nine, a college student used "reach out and touch it" three times. But anyone who is familiar with old AT&T commercials knows that no mental transformations produced the three compounded infinitive phrases. Just how damaging formulas are to the research of Hunt, O'Donnell, and Loban is impossible to tell. All the researchers give some examples of what they are counting, but transcripts of the students' writing are not available for review. O'Donnell, for example, gives "man outside" as an example of a transformation that was apparently counted (58), and from one point of view we can see why he would do so. "Man outside" is comparable to "bird in the tree," which O'Donnell discusses in the passage quoted above. We can look at "man outside" as a reduction of "man who is/was outside." It is much more likely, however, that children master this phrase as a formula. They are likely to frequently hear things such as "It's just the dog outside," and "It's the boy outside the store." The problem of formulas raises still another one. Perhaps because of their lack of a theory, the researchers counted all transformations as basically equal. There are, for example, numerous and complex transformations involved in creating the various forms of verb tenses. In that he briefly discusses them (19) but does not count them, O'Donnell suggests that some developmental transformations are more important than others. But he does not explain why, and he does not extend the idea of relative importance to the other constructions that he counts. I attempt to deal with this problem in more detail in the section on Theory, but here I want to suggest that transformational sequences that students are learning pose a great deal of difficulty, whereas transformational sequences that have been learned pose almost none. Thus, for example, once students have mastered the transformations that create verb tenses, these transformations become automatic. Because they no longer have to focus on these transformations, students are able to attend to others, gradually adding more and more constructions to their automatic inventory. A simple count of transformations, therefore, remains problematical without further consideration of both formulas and the relative sequential difficulty of the transformations. It is very possible, therefore, that the subordinate clauses, appositives, participles, etc. in the writing of most pre-seventh graders are formulaic. Thus far, I have discussed formulas in the context of the research, but they may be very important in what and how we teach. I know I am not supposed to, but I will admit that sometimes I drink coffee while driving, especially on long trips. Sometimes, while driving, I even fill my coffee cup from my thermos. I can do this, with care, because I have been driving for more than thirty years. Driving has become automatic. If I had tried to drink coffee while I was learning to drive, my driving instructor would have told me to pull over and have gotten out of the car. He would not have wanted to be in the almost certain crash. Because syntactic development takes place in students' brains, where we can't see it, we tend either to not see, or to ignore, all the possible hazards. Formulaic expressions in students' writing and speech often deceive teachers into thinking that their students understand advanced constructions when, in fact, they do not. Many teachers, for example, claim to have seen participles, appositives, etc. in the writing of their young students, and thus claim that their students can understand and will be helped by grammatical explanations of these constructions. But when they are asked if what they saw might be formulas, these teachers have usually never even heard of the concept. Attempting to force advanced, "late-blooming" constructions into the writing of students who are not ready for them may cause mental confusion and crashes. These crashes may be just as, or even more serious than, the crash I certainly would have had if I had attempted to drink coffee while just learning how to drive. In this respect, Loban's study is particularly important. The graph given above is just one of many that demonstrates significant differences between advanced and slower students. The advanced constructions that teachers claim to see may just be in the writing of these students. If that is the case, the advanced students don't really need more help, especially if that help comes at the cost of confusing the less advanced students. If the constructions appear in the writing of the weaker students, they are probably formulas. As noted in the previous chapter, Hake and Williams suggest that sentence-combining exercises, for example, are effective only when students are ready for them. Throughout this chapter I have suggested that these researchers have shown that some grammatical constructions develop later than others. The general outline of that development appears to be 1) the development of basic sentences through sixth grade, 2) the blooming of subordinate clauses in seventh and eighth grades, and 3) the late blooming of constructions such as the gerundive and appositive. Hunt was the researcher who explored and expressed this sequence the most clearly and forcefully. The science of measuring syntactic maturity is barely emerging from the stages of alchemy. It scarcely deserves to be called a science at all. But we do know a few things. For the last thirty years we have known at least three things about the development of language structure. First, as children mature they tend to produce more words on any given subject. They have more to say. Second, as children mature, the sentences they use tend to be longer. Third, as children mature a larger proportion of their clauses are subordinate clauses. Hunt's focus is clearly on "measuring," but do I detect in that last paragraph a caution against rushing natural syntactic development? From the first public school grade to the last the number of subordinate clauses increases steadily for every grade. As the graph from Loban (above) indicates, this turned out to be an oversimplification, but we need to keep in mind Hunt's purpose here, and his non-technical audience. We should also note that this article precedes the massive focus on sentence-combining, massive in the sense that entire classes were subjected to such exercises, often with no regard to what grammatical constructions their teachers saw in the students' writing. Now remember that my argument here is that Hunt, particularly at this point in his career, is just counting. His numbers, moreover, may be suspect. But the examples that he gives are extremely significant, particularly because of the range of constructions involved . He immediately turns to appositives: "If a clause contains a predicate nominal, it can become an appositive, and the rest can be thrown away." "There was a lady next door who was a singer" can be written as "There was a lady next door, a singer." (734) He gives two more examples of this: 1) "His owner was a milkman. The milkman was very strict to the mother and babies. (who was very strict . . .)" becomes "His owner, a milkman, was very strict to the mother and babies." 2) "One day Nancy got a letter from her Uncle Joe. It was her great uncle. (who was her great uncle.)" can become "One day Nancy got a letter from her great uncle Joe." Most readers would probably agree that he has successfully made his point. He then goes on to explain that the reductions are improvements in style because the words that are "thrown away" are insubstantial. He has also demonstrated a variety of grammatical ways in which these reductions can occur. Since he is interested in proving that reductions occur and that their appearance is a good thing, he never suggests that his examples of the ways in which they occur are exhaustive, nor does he suggest that some of these ways may be more difficult than others. In turning to the negative side of this article, I need to note that I am asking for more than what Hunt himself claimed to be trying to give. Hunt was, however, so close to a theory of natural syntactic development that we need to look at what he was missing. One of the more interesting aspects of the article is that Hunt discusses the alternatives (subordinate clauses and non-clausal versions) almost as if they are developmentally equal. Is he suggesting, for example, that an eighth grader has an equal option between using a subordinate clause and using an appositive? He never makes this clear. He does describe the embedding of each example as a subordinate clause first, and then demonstrates that each can be further reduced to a non-clause. But if I understand it correctly, this was a basic principle of the transformational theory that Hunt was using. Kernel sentences (basically, the sentences written by the fourth graders) are first embedded into another sentence, and then reduced, either to subordinate clauses or to non-clausal constructions. It is possible, therefore, that Hunt was simply following transformational theory, and was not suggesting, in this article, a sequence of development beyond the subordinate clause. A similar problem appears within the discussion of the less-than-a-clause reductions. The numbers he gives suggest that some of these reductions are used less frequently than others, but the way in which he presents the numbers makes the question obscure. "Percent of increase" can be deceptive. Eighth graders, he noted, "use such prepositional phrases to modify nouns 170 percent as often, and twelfth graders 240 percent as often, as fourth graders do." This can mean that the fourth graders used this construction 100 times, the eighth graders 170 times, and the twelfth graders 240 times. On the other hand, when he stated that "Eighth graders wrote a third more appositives than fourth graders," it may mean that he found three appositives in the writing of fourth graders, and four in the writing of eighth graders. Whether intentionally or unintentionally, the numbers were presented such that they obscure the question of relative difficulty and frequency. In addition to that, Hunt ignores the problem of formulas. Is "great uncle Joe" a true appositive (one formed by embedding and deletion), or is it a formula? Hunt was, I am sure, aware of the third "problem" with his presentation in this article. Embeddings and deletions which result in compound subjects and verbs were recognized early by all these researchers. A fourth grader is likely to write, "Sally went swimming. And Molly did too." By eighth grade, this is much more likely to be expressed as "Sally and Molly went swimming." The fourth grader's "We played baseball. Then we went to dinner," will, by eighth grade, probably be expressed as "We played baseball and then went to dinner." I have mentioned this "problem" only to set the background for explaining another, and major contribution of Hunt's, a contribution that is suggested in the variety of reductions that he covered in this article. One of the things that all these researchers noted is that syntactic development is "glacially" slow. In attempting to determine what happens, i.e., what changes occur, they had little time to explore why. Hunt, O'Donnell, Loban -- all noted that in seventh or eighth grades subordinate clauses blossom, but none of these researchers ever explained in any depth why they don't blossom sooner. If we shift our perspective from what happens to where and how it happens, Hunt's list of reductions to less than a clause becomes very suggestive. We need to put the sentences that Hunt discusses back into a context. No student ever writes simply "The jewel was in the drawer. It was red." These sentences were written as the student attempted to write a story or paragraph to convey ideas that were in his or her head. This particular sequence of sentences gave Hunt the opportunity to use them as an example of how the second could be combined into the first, but how often does this opportunity occur in the writing of fourth graders? My experience with the writing of fourth graders is limited, but from what I have seen, they have a tendency to write two, three or four sentences on a topic, and then jump to a different topic. The opportunities would have to appear within the discussion of a specific topic, and frequently what they write presents few useable opportunities. Note that Hunt is clearly suggesting that fourth, fifth, sixth, etc. graders automatically (no instruction involved) begin to make such combinations. They may do so unconsciously (in their heads) and/or consciously, i.e, they may write it out as two main clauses and then consciously revise. Hunt was also well aware of the distinction between competence and performance. A fourth grader may well be competent to make this combination, but simply opt not to do so. Writing involves a lot more than just making longer, more complicated sentences. In his attempt to show that such embeddings and reductions occur, Hunt gave a number of types of examples, but, as noted above, he does not even begin to suggest that his list is comprehensive. There are, in other words, probably many more ways in which the important information in one "base" clause can be embedded into another simple main clause. Fourth graders thus have numerous possible ways of combining -- in the context of real writing, writing which presents relatively infrequent opportunities for each such combination. Students, moreover, may or may not opt to use them, even if they are competent to do so. It has sometimes been suggested that in fourth grade students learn how to write basic clauses; in seventh and eighth, they learn how to subordinate clauses. In between the two, they goof off. But that is not the case. Hunt's list of types of reductions suggests that massive growth may be occurring in these years, but that we simply haven't seen it because we haven't known what to look for. We need to keep this in mind before we try to get pre-seventh graders to increase the frequency of subordinate clauses in their writing. There is much more that can be said about Hunt's "Recent Measures in Syntactic Development," some of it positive, some negative. But the article is short and not very technical. I strongly suggest that anyone interested in the details of syntactic development should read it. I have probably already gotten too far ahead into KISS theory, but I have done so to demonstrate that Hunt was already so close to it. He was even closer in a later article. In 1977 he published "Early Blooming and Late Blooming Syntactic Structures" (in Cooper and Odel, eds. Evaluating Writing. NCTE, 1977. 91-104). Like "Recent Measures," it is short, easy to understand, and very important for anyone interested in natural syntactic development. Unlike his earlier and most famous study, the study reported in "Blooming" involves what Hunt calls "rewriting" as opposed to "freewriting." Whereas for the earlier study he had simply collected samples of whatever the students were writing about for school, in this "rewriting" study participants were given the "Aluminum" passage and asked to rewrite it. The "Aluminum" passage is written in very short sentences. Hunt includes the entire passage at the end of the article, but he discusses the first six sentences: 1) "Aluminum is a metal." 2) "It is abundant." 3) "It has many uses." 4) "It comes from bauxite." 5) "Bauxite is an ore." 6) "Bauxite looks like clay." In explaining the advantages of the passage as a research tool, Hunt notes that "since all students rewrite the same passage, all students end up saying the same thing -- or almost the same thing. What differs is how they say it. Their outputs are strictly comparable." (92) To demonstrate this, Hunt gives three rewritten examples. Aluminum is a metal and it is abundant. It has many uses and it comes from bauxite. Bauxite is an ore and looks like clay. Aluminum is an abundant metal, has many uses, and comes from bauxite. Bauxite is an ore that looks like clay. Aluminum, an abundant metal with many uses comes from bauxite, a clay-like ore. The passage can be an excellent research tool. Unfortunately, Hunt was, by this time, himself somewhat caught up in the sentence-combining frenzy, so he missed some of the problems with it. Often overlooked, but perhaps one of the most important aspects of this article is that Hunt, all by himself, partially closes the "gap" that had led to the "race-horse" studies and the subsequent emphasis on sentence combining without instruction in grammar. Hunt was, of course, himself largely responsible for the gap -- his studies had demonstrated the wide gap between 12th graders and "superior adults." You may have noted that his earlier "Superior Adults" has now become "Skilled Adults." Hunt was able to get rewrites from twenty-five "authors who recently had published articles in Harpers' or Atlantic." (96) These are his "Skilled Adults." But he added a group between these skilled adults and the 12th graders: "twenty-five of Tallahassee's firemen who had graduated from high school but had not attended college rewrote the passage too. They will be called average adults." (96) To reinforce the validity of his previous work, Hunt turns to words per T-unit and gives the figures for grades four, six, eight, ten, twelve, for the average adults, and for the skilled adults. The figures are 5.4, 6.8, 9.8, 10.4, 11.3, 11.9, and 14.8. He then states, "Notice that average adults are only a little above twelfth graders, but skilled adults are far above both groups." I have already discussed the problems with this gap, so here I will simply suggest that the gap might close still more if we knew more about the high-school students (How many of them graduated?) and about the firemen (How many of them had had advanced, but non college education?) Remember also that in using the edited articles from Atlantic and Harper's, Hunt had arrived at a significantly higher 20.20 words per main clause for the "Skilled Adults," and a gap of almost six words between them and the 12th graders. Here, that same gap has dropped to 3.5 words. It is somewhat ironic that Hunt was closing the gap that started the rush towards sentence-combining at the same time that he himself was getting caught up in the rush. Perhaps because of space limitations, "Early Blooming" is a bit confusing. Although it is primarily about the "Aluminum" passage, Hunt discusses the revision of another, ("Chicken") passage, and he ends up scrambling the results from revision of both, including the university students' revisions of the "Chicken" passage. Like all these research reports, this one is crammed with data and ideas which fascinate those of us who are interested in the problem. Here, however, I have to limit myself to two of what Hunt considers the middle and later blooming constructions. First of all, the results that Hunt gives for appositives are all from the rewritings -- there is no check against freewriting. Second, as Hunt himself notes, the "Aluminum" passage gives students four opportunities for creating appositives. Third, there were apparently 50 children in each grade level. (Hunt simply states that there was a total of 250 schoolchildren in the five grades.) This means that even with the 36 appositives for the eighth graders, we are talking about less than one per student, and remember that there were four "invitations" for each student. The fifth problem is related, in part, to the fourth -- if the appositive is a sign of maturity, why does the number decrease for tenth and twelfth graders? And why doesn't he give us the numbers for the average and skilled adults? And finally, sixth, there are some problems with the "Aluminum" passage as a research tool that are not well understood. I noted previously the significant decrease in words per main clause between the skilled adults' rewritings of the "Aluminum" passage and their articles in Atlantic and Harpers'. I have also done a fairly complex study with the passage myself. (Available on the KISS web site, it provides a detailed analysis of rewritings by 93 college Freshmen.) Although I was not able to include the analysis of my students' freewriting in that study, I noted a very significant, similar difference in words per main clause. Whereas my Freshmen (as a group) usually average very close to 15 words per main clause, in rewriting the "Aluminum" passage, they averaged only 10.7. Clearly there are some major psychological differences between rewriting someone else's sentences and creating a text oneself. If the preceding cautions seem excessive, we need to remember what we are discussing here. We are talking about meddling with our students' minds, minds which Mother Nature develops naturally and, generally, beautifully. Disappointingly, from my perspective, Hunt in this article talks about sentence-combining in the elementary grades as a good way to improve students' writing. (102) Mellon, in his paper at the conference discussed in the preceding chapter, stated that "Sentence combining produces no negative effects . . ." (35) The final words of his presentation were "the best advice I can give teachers today, relative to sentence combining, is -- Do it!" (35) The problem with this, and perhaps the main reason that sentence combining has lost its initial charm, is that it should be done with an eye on natural syntactic development. There are probably major differences between giving eighth graders combining exercises in which they create subordinate clauses, and giving them exercises that necessitate appositives. There is certainly a difference between following and supporting Mother Nature, as opposed to forcing her. Whereas I have suggested caution about Hunt's conclusion relative to eighth graders and appositives, I would suggest that his data can be interpreted more forcefully in a different way -- fourth and sixth graders are clearly not ready for instruction in appositives. Given 200 invitations each (50 students times 4 invitations per student), they produced only one and eight appositives respectively, and even here, without the transcripts, we cannot be sure that the appositives that they did produce were not formulas. The NCTE resolution against the teaching of grammar demanded theory and research, but what good are theory and research if we do not use them to guide our instruction? She slept all the time, laying no eggs. By 10 twelfth graders this construction was produced twice. Here are both examples. The chicken cackled, waking the man. Blaming the chicken, he killed her and ate her for breakfast. The gerundive is a late-blooming construction -- perhaps as late as college. Near the end of the article, Hunt does suggest the application of the "blooming" sequence to teaching. "The kind of information given previously as to which structures bloom early and which bloom late would be preliminary to actual measures of teachability at a given level." (102) This sentence is never developed and has been ignored. Thus we have sentence combining exercises for second graders in which they are required to use appositives, and even, in some cases, gerundives. Hunt was, as I suggested at the beginning of this section, very close to the KISS theory of natural syntactic development. In fact, he was extremely close. In Part Two of this book, we will see just how close, but first we need to address the (lack of) development of Hunt's theory and the problems of additional research. I am often asked if there is research on natural syntactic development that is more current than that of Hunt, O'Donnell, and Loban. When I say that the answer is basically "No," I am asked "Why?" To answer both questions, we really need to go back and ask why the research on natural syntactic development exploded into the scene in the 1960's. There are probably two reasons for that -- money and Hunt. All of the major studies cost money. After the Soviet launch of Sputnik in 1957, the Federal government, as well as various foundations, poured waves of money into education for math and the sciences. The push for new ideas in education, of course, also affected the Humanities, and thus more money than usual was available for research in English. Grants were relatively easier to get. Among others, Hunt got some. Grants are more likely to be renewed, or other grants are more likely to be obtained, if one's initial grants result in something productive. As should be obvious by now, Hunt's original projects were certainly productive. They led to numerous other educators wanting to build on Hunt's work, especially in an attempt to close that terrible gap between 12th graders and superior adults. A gap that wide was clearly visible, even to our politicians. Thus, more research was supported. But as I noted in the preceding chapter, the focus of that research changed direction. 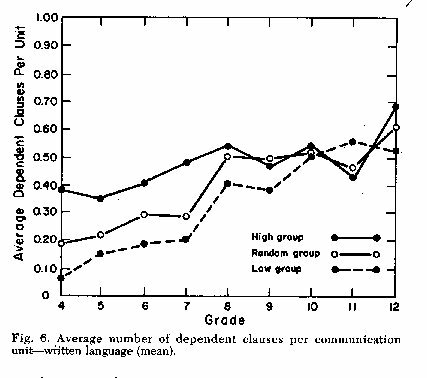 Whereas Hunt, O'Donnell, and Loban were studying natural syntactic development, most of the subsequent studies were race horses, racing to close that gap, and pitting one approach to teaching against another. Meanwhile, of course, an anti-grammar attitude was building. By 1973, NCTE had published O'Hare's study, "clearly" demonstrating the possibility of "Improving Student Writing without Formal Grammar Instruction." The incoming tide of that sentiment did not reach its full height until the 1985 NCTE resolution against the teaching of grammar "not supported by theory and research." As that tide ebbed, the shoreline was left with scattered fragments of grammar, and a few lonely voices (mainly Martha Kolln on the national scene) willing to argue for the teaching of grammar, in any sense. This book, I might note, is being written at the invitation of Peter Feely, the K-12 Acquisitions editor of NCTE. It will be interesting to see if the preceding paragraph gets by him, and then by his editorial readers. It is, I would suggest, very important, for there are more than just lessons about grammar to be learned from the "Great Grammar Debate." Advocates of teaching grammar in any shape or form were heckled and scorned. They were made to feel like idiots. I personally became aware of the debate in the late 80's, and for anyone who is interested, I have documented some of my experiences with it in one of the "Essays on Grammar" on the KISS web site. Within that anti-grammar tide, who was going to propose a research study on grammar? And if someone did, who was there to support it? As noted in the previous chapter, the megastudies by both Braddock and Hillocks had concluded that the question was "closed." It was a shameful chapter in the history of NCTE. Hopefully, we have learned from it. Hopefully, there will be no more tides. Having dealt with the "political" aspects of the answer, we can look at the more technical. For one thing, of course, the money had dried up, but so had the potential pool of researchers. Many of the interesting smaller studies had been done by, or at least been helped by, middle and high school teachers. The anti-grammar tide, however, had resulted in most future teachers getting very shaky, if any, instruction in grammar. How could they do research about something they knew almost nothing about? In addition, however, we had learned a lot from the previous research -- and, beyond what I have summarized above, most of what we have learned is about the nature of such research itself. To be valid, such research is extremely difficult to design, very expensive, and time-consuming. Remember that Braddock has been looking for "a dozen or so most soundly based studies," and he could only find five -- about all aspects of teaching English. Hillocks found a similar problem. One major difficulty, for example, concerns the very collecting (selecting?) of the writing or speech samples to be studied. We now know that mode (narrative, descriptive, expository) affects what we will see. So does the choice of topic. What does a student who has never had a "vacation" write when asked to write about his last one? The sentence-combining studies, and the now frequent use of sentence-combining exercises, have shown that we need to know even more than we thought we needed about the backgrounds of the students to be studied. Clearly students who have done sentence combining exercises within the previous year will perform differently than those who have not. I have been unable to give Loban's study the attention it deserves, but one of the things that he has clearly shown is that we need to at least consider the differences among students at the same grade level but of different levels of ability. Loban's study, I should note, is probably the most valid -- he studied the same group of students over a period of thirteen years! He thus had the data to study not only group averages, but also the changes in single students from year to year. But how many people have the time, energy, and resources to perform such a study? We also need to note that the legal situation has changed. It is not as easy to get samples of students' work for research purposes as it used to be. Now, we need to be very concerned about release forms, etc., even for a study in which the students' work will not be made public. Most of the preceding, moreover, concerns studies in natural syntactic development, not "race-horse" studies. Studies that compare one approach to another have an additional host of problems, the most important of which is that the researcher usually should not be involved in the study! The Braddock and Hillocks reports both point out some of the problems involved when the researcher teaches one of the experimental classes and/or evaluates the data. And, as I suggested in the preceding chapter, even when the researcher simply runs a "norming session" for outside evaluators, how are the rest of us to know that those sessions did, or did not, affect the evaluations in favor of the researcher? In effect, anyone with a new idea is caught in a Catch-22. Their own research is not acceptable, but how are they going to convince others to put what is a rather large investment of time and money into research that is not already in some way supported by research? Last, but probably not least, we are now more aware of the problems involved in the very definition of the term "grammar." Hunt and O'Donnell, and to an extent Loban, believed that they were using Chomsky's transformational-generative grammar. That grammar, however, was criticized, and not only did Chomsky modify it, we have had an explosion of transformational grammars. In addition, we now have systemic, tagmemic, etc., etc. grammars. Which grammar should the researcher use? Realize that it make take a researcher a year or more just to learn one of these grammars, after which he or she will have to decide if it is appropriate for what the researcher wants to study. And then, if the researcher does decide that it is appropriate, he or she faces the task of convincing the general members of the profession and/or the advocates of the other grammars, that this particular grammar is worth studying for such and such reasons. It won't be easy. Is Decent Future Research Possible? In addition to providing a home for such data, one or more such organizations should be persuaded to collect additional samples for study. I have already suggested some of the problems in data collection, among which is the fact that a researcher who collects his or her own is immediately suspect. These samples should be, obviously, from different grade levels in different socio-economic areas. They should include examples of writing in different modes. Some of them should be snapshots of an entire class (as in Hunt's and O'Donnell's studies), but some should include longitudinal studies of single students, comparable to Loban's. And, like Loban's, the collection should include information about the relative proficiency of the students. Hunt, for example, in his major study, was very careful to note that his subjects were specifically selected to be within an IQ range of 90 to 110. He was interested in students of average intelligence. What this means, however, is that we have no way of knowing how his conclusions relate to the students at the higher and lower ends of the spectrum. Loban's study convincingly demonstrates that we need to take this into consideration. What I am suggesting implies, of course, a big task. An organiation would probably have to set up a special commission to decide what to collect, how, and with what supporting information. Then it would have to do it. But such a database would serve several important functions, most of which probably go beyond just the questions related to grammar. Within the area of grammar, such a database would relieve those of us interested in studying natural syntactic development of all the problems and questions associated with data collection. Instead of worrying about how to collect samples, and then, no matter what we do, having those samples called into question, we could simply study samples from the database. Since that database would be openly available, anyone who wanted to could get the same samples in order to check, or to extend, previous research. For people interested in comparing different teaching approaches, such a database might provide a "control" group. If someone wants to try to show that approach X provides better than normal "improvement," instead of dividing their own student subjects into a control and an experimental group, they could put all their students in the experimental group, thereby increasing the "N" for the study. And, if the organization that stores the samples also stores detailed studies about the samples, these experimenters might not even have to analyze the data from the control group. Suppose, for example, that three such collections of samples of the narrative writing (of seventh, eighth, and ninth graders) were available. I would probably analyze them, as I have the samples of fourth and seventh graders (available at the KISS site). I would be more than happy to send a copy of all the transcripts, including my detailed analysis of each of them, to the organization that made the samples available. A researcher interested in a comparative study might look at my analysis and decide that my definitions of terms, etc. will work for him or her. That researcher could then simply use my analysis as the analysis of the control groups. I might also point out, however, that such a national database would serve as a check point for anyone who wanted to use his or her own control groups. With all the transcripts available, other researchers would be able to study everything, perhaps deciding that a researcher's own control group is not reflective of the norm. Within the realm of grammar, but beyond my own concern with syntax, such a database might well be used for the study of usage variations and "errors." How frequent are the "errors" that we worry about? Are we still trying to teach students not to begin a sentence with "But"? Beyond grammar, but certainly related to it, such a database could be used to study the development of vocabulary. And related to both grammar and vocabulary, the database could be used to study cognitive development. Hunt quite clearly noted a relationship between syntactic and cognitive development, and the other researchers probably noted it as well. None of them, however, was able to take the study very far. In this regard, my study of the 93 rewritings of the "Aluminum" passage is incomplete. The passages are all analyzed in detail for syntax, but in making that analysis I noted interesting omissions that suggest, for example, that a "higher," cognitive framework guides and clearly affects students' rewriting. I therefore divided the passage up into "idea units," a concept used by Carol S. Isakson and Jan H. Spyridakis. Basically, an idea unit is the smallest possible fragment of "meaning" that a text can be broken into. (They are very close to, but not always identical to, kernel sentences.) With an N of 93, I began to notice a pattern of omitted idea units. Eleven of the students omitted the generalization "[workmen] extract these other substances from the bauxite." Since the following nine idea units present the details of the extraction process, did these students perceive the generalization as superfluous? On the other hand, there were many students who included the generalization, but left out one (sometimes several) of the details. Is there a relationship between these patterns and the patterns of syntactic structures that these students used? That is something that I have still to study, but the details on idea units themselves, and my analysis of which were included and excluded in each rewrite, -- all of these are available on the web for others to use and study. Perhaps of more interest to teachers of writing, in analyzing the idea units, I noted that some of the students clearly perceived (and emphasized) the passage as a simple narrative. ("First," "then," "next," "later," "finally.") Other students deemphasized the time sequence and emphasized purpose. ("To extract the aluminum . . ." "To separate the aluminum from the oxygen, workmen use electricity."} Still other students emphasized means. ("…extract by grinding…" separate … by using electricity.") Obviously syntactic fluency affected the students' choices, but the "Aluminum" passage gives us an opportunity to at least begin to look at the cognitive side of the question. I can't leave the topic of future research without at least a few comments on the question of grammatical terminology. If there really is interest in such research, perhaps the NCTE Commission on Research should set up a commission to provide two, three, or perhaps more sets of "standards" for terms and for counting words. These sets could easily be made available on the NCTE web site. Perhaps the worst part of reading (and writing) research reports is getting through the definitions of the terms to be used and the counting procedures. Large parts of this section of a report are often obvious (or confusing), repetitious (of other studies), and boring. One has a tendency to fall asleep. One really shouldn't do that, however, because important distinctions creep in. O'Donnell, for some reason, decided that words like "snowball" would count as two words. He claims that he did it to "make the count more uniform and meaningful." (33) I don't understand how it makes the count more meaningful, and, as for uniformity, his decision makes his study less uniform, and thus less comparable, to those by Hunt and other researchers. There will, of course, be some debate about what should be in the "standard" sets. That debate should, in itself, be productive, since it should clarify what is being counted and why. Note too that I am suggesting more than one set. Researchers could choose among them. And even more emphatically, please note that the "standards" should not be limiting. Their purpose should be to simplify and clarify. In the "current" research, it is not at all unusual to find statements such as "We followed Hunt's procedure in defining T-units, as modified by Mellon." This means that, before you can understand the study you have in your hand, you have to get your hands on Hunt's study (if you are not familiar with it) and on Mellon's study. Once you have figured out what Hunt did, and how Mellon modified it, you can return to the study that you started with. Research would be much easier to produce and to read, if researchers could start these sections with statements such as "We started with the NCTE Set of Basic Terms #3, with Word-Count Procedure #2, with standard # 2 for counting T-units, and with Standard #1 for dealing with garbles. With all of these "standards" on the NCTE web site, anyone who was interested could easily access them. The researchers could them explain only the ways in which they modified the standards they chose. Take a break. Theory is next. [for educational use only] Click here for the directory of my backgrounds based on art.